Well, many people complain of feeling tired and fatigued most of the time. 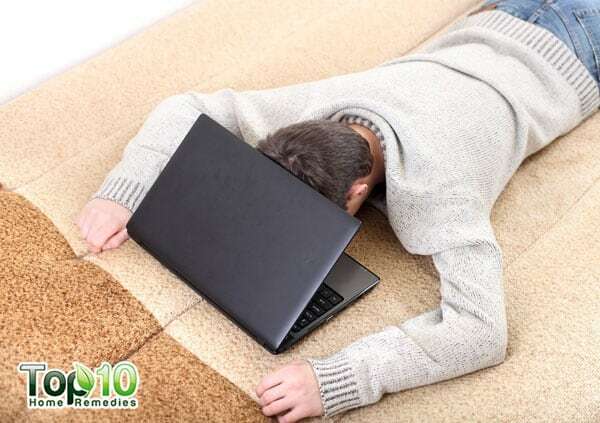 Due to tiredness, you may experience reduced or no energy, physical or mental exhaustion and lack of motivation. There may be medical and non-medical causes of fatigue, including personal dietary and lifestyle habits. 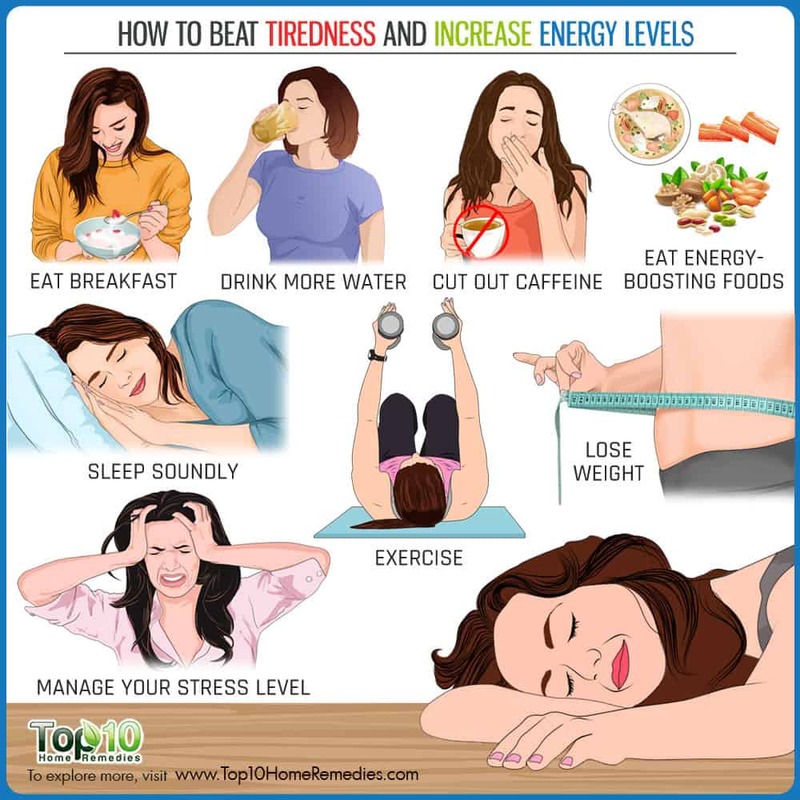 Some common factors that may contribute to tiredness are stress, anxiety, depression, anemia, diabetes, pregnancy, breastfeeding, inadequate sleep, malnutrition, obesity and excessive exercise. Consuming too much caffeine, drinking too much alcohol and eating junk food can also impact your energy levels. Feeling tired can have a negative impact on your performance at work, your family life and social relationships. But if your tiredness is related to minor issues, it can be easily reversed by living a little smarter and making a few healthy choices every day. You can banish tiredness from your life and live with vibrancy and full of energy! 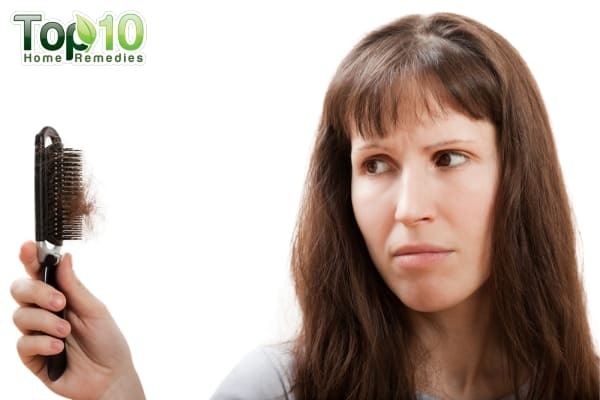 Here are the top 10 ways to beat tiredness and increase your energy levels. Eating breakfast is a healthy habit. When you skip breakfast, you may feel tired by mid-morning. Going without food for too long allows your blood sugar levels to dip and it can take a toll on your energy levels. But eating just anything for breakfast is not a good idea. You need to choose the right foods, including those that boost your metabolism and give your body energy to burn. 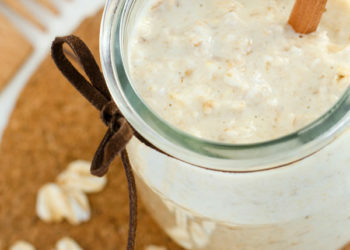 A good option for breakfast is a big bowl of oats with some fruit and nuts. It will provide you with filling fiber and even a little protein. Plus, it’s good for people who experience blood sugar spikes and drops from eating other processed breakfast cereals. 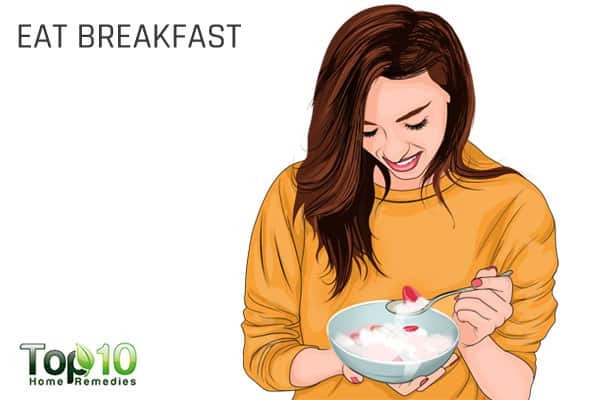 Carbohydrate-rich breakfast foods like cereals or whole-grain bread are good options. Staying hydrated can make you more energetic and help you fight tiredness. Depending on your age, your body is made of 50 to 75 percent water. Water is important for proper functioning of different organs of the body. In fact, when the body is dehydrated, it can affect your energy levels as well as brain functioning and mood. Being even slightly dehydrated can take a toll on your energy levels. When you are not drinking enough water, your blood pressure drops and there is a low supply of oxygen to the brain. This, in turn, can leave you feeling tired. To stay hydrated, make sure you drink 8 to 10 glasses of water a day. 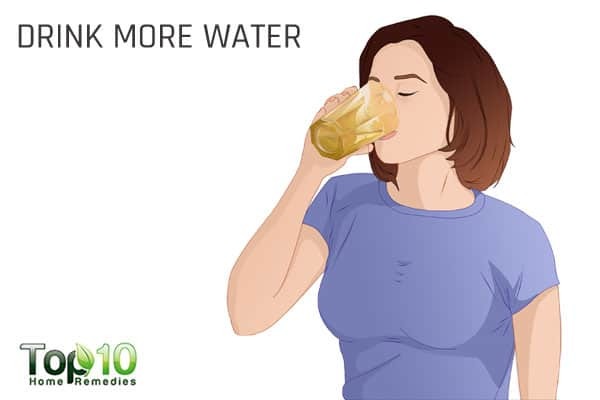 However, depending on the weather, your activity levels, and age, you may need a little more water. To keep you energetic throughout the day, you must try to eat the right foods. 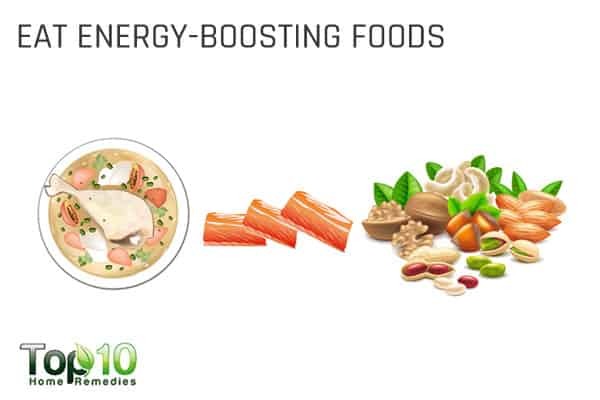 In fact, the food you eat has a direct impact on your energy levels. Include more fruits and vegetables in your diet. The fresher your food is, the more nutrients you’ll get into your body. 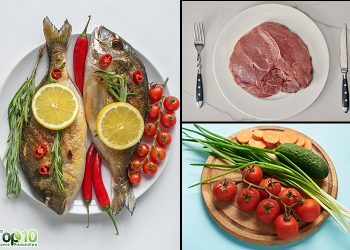 Lean meats like chicken, turkey, and fish will provide your body with quality protein. Fish that are high in omega-3 fatty acids, such as salmon and tuna, are also beneficial. Choose whole-grain foods and complex carbohydrates rather than processed and refined carbohydrates to ensure that your body gets the full benefits of fiber and other important nutrients. Also, include nuts and seeds in your diet to beat fatigue and fight hunger. If you’re not getting everything you need from your food, consider taking some kind of supplement. Make sure to talk to your doctor before taking any nutritional supplements. Not just the right foods, you need to follow the right eating habits, too. Eat several smaller-portioned meals throughout the day instead of two or three large meals a day. Improving your sleep habits to ensure that you get adequate sleep can help a lot in beating tiredness and keeping you energetic throughout the day. Lack of sleep is one of the leading causes of daytime fatigue. A 2004 study published in the Journal of Psychosomatic Research reports that disturbed sleep is an important predictor of fatigue, apparently stronger than previously well-established predictors, such as workload, being female and lack of exercise (1). Adults need about 8 hours of good sleep per night. No matter how busy you are, you must get the much-needed rest and sleep. To ensure proper sleep, go to bed and get up in the morning at the same time every day, avoid long naps during the day and enjoy a warm bath or shower before bed. Also, do not forget to create an electronic sundown to prepare your body and mind for sleep. Turn off all your electronic gadgets well before bedtime. People living a sedentary lifestyle often feel low on energy. So, start doing regular exercises like brisk walking or cycling to boost your energy levels. Exercise also improves the working efficiency of your heart, lungs, and muscles. It also improves mood, thanks to the endorphins being released in your body. Feeling gloomy only contributes to fatigue and tiredness. 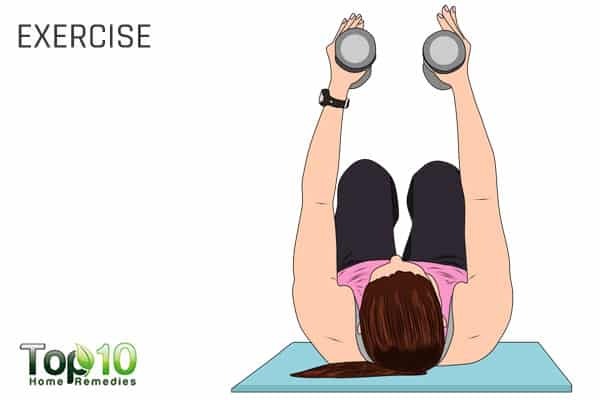 A study published in the Journal of Sports Sciences in 2009 found that acute moderate- to high-intensity lower-body resistance exercise increased feelings of energy during and after exercise (2). Whenever you feel tired, stand up and go for a walk. Soon you will find that your stamina and energy levels have increased. Drinking too much coffee or caffeinated soda can also take a toll on your energy levels and make you feel tired. For many, a cup of coffee seems to boost their mood and brain functioning. But in reality, it increases your blood pressure and pulse rate, which in turn affects your energy levels. Too much coffee can also affect your adrenal gland, leaving you tired, unenthusiastic and fatigued. It even has a dehydrating effect on your body. If you drink coffee before bedtime, it can interfere with your normal REM (rapid eye movement) sleep, which can cause you to feel tired after waking up. 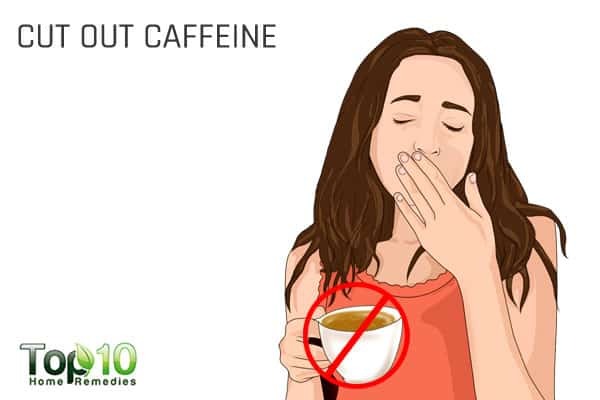 So, if you have a habit of drinking too much coffee or soda, it is time to cut back on the amount of caffeine you consume during the day. Two cups of coffee per day is all you need. 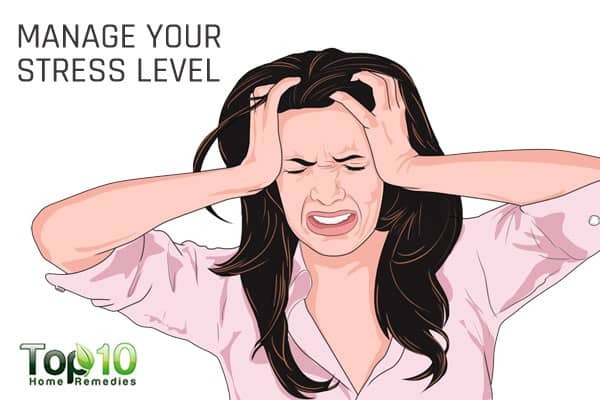 Stress has a negative impact on your health as well as your energy levels. When living a stressed life, it often means you are struggling hard to concentrate and investing more energy to finish a task. 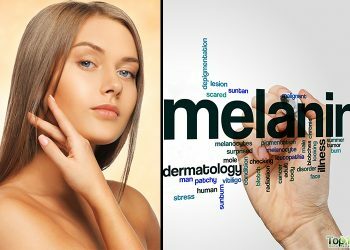 This can take a toll on your physical and mental health, and ultimately your energy levels. Stress also makes it hard to enjoy sound sleep, thus making you feel tired even after a night’s sleep. In addition, it leads to loss of appetite, which again is important for your energy levels. If you are under stress, try deep breathing exercises to relax your mind and body. Listening to music and investing time in a hobby can also help reduce stress and increase your energy levels. If your body is carrying excess weight, it can be exhausting for you and you may feel tired most of the time. Extra body weight also puts extra strain on your heart, which can make you more tired. Moreover, obesity can cause restless sleep throughout the night and lead to sleepiness and low energy during the day. Plus, people who are overweight find it hard to move around and ultimately lead a sedentary lifestyle. So, if you are overweight, take steps to lose some weight. 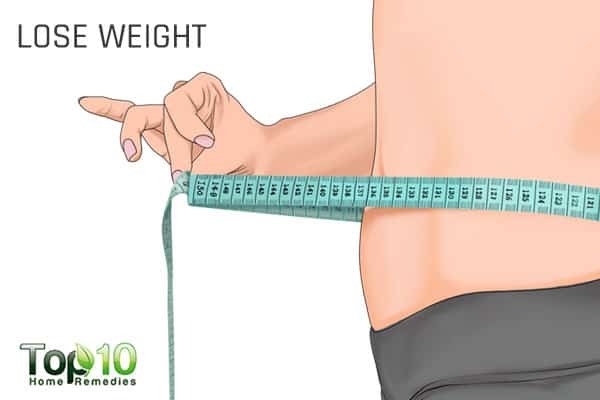 As soon as you start losing some pounds, you will start feeling much more energetic. For weight loss, the recommended strategy is to cut back on portion sizes, eat balanced meals and increase your physical activity. Taking time to relax, perhaps trying meditation, can also help fight tiredness and make you more energetic. Meditation helps you become more aware of your inner soul as well as nearby surroundings. In fact, when you pay attention to something, you are giving it energy. So, when you are meditating, you feel more energetic. Moreover, your focus is on breathing during meditation. This means your body is getting more oxygen. Oxygen helps the cells in your body regain energy. 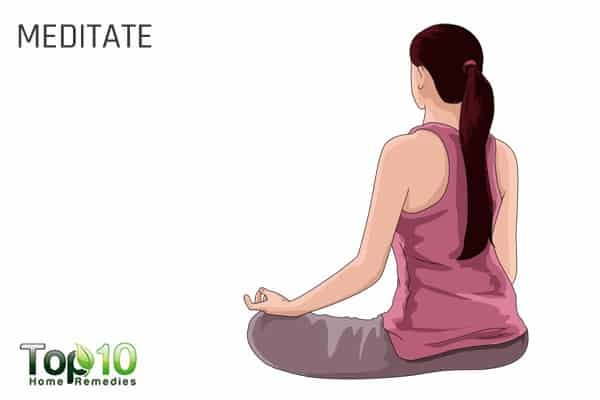 Meditating 10 minutes daily is all you need to keep yourself energetic throughout the day. Moderate drinking is not bad for your health, but when your drinking exceeds the limit, it gives rise to different health problems, including low energy levels. First of all, alcohol acts as a sedative and makes you feel drowsy. 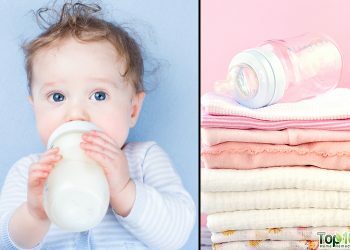 But over time, regular drinking can interfere with the quality of your sleep, which in turn leaves you feeling more tired even after sleeping the whole night. 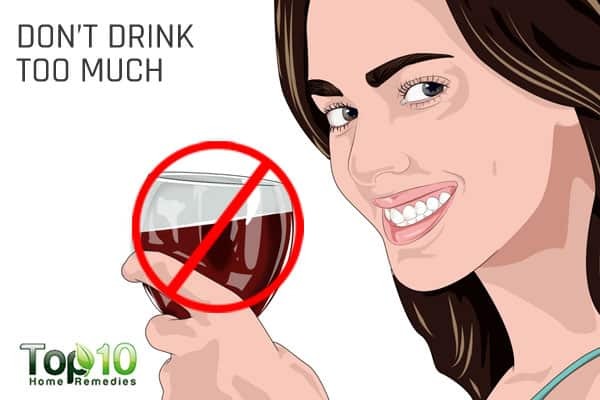 Alcohol also has a diuretic effect, meaning that if you drink more before bed, you may have to get up at night to go to the bathroom, which again disturbs your sleep. Plus, alcoholic drinks can contribute to dehydration. Hence, it is better to drink in moderation or avoid it totally. In addition, avoid the use of nicotine and do not do illegal drugs. Akerstedt T, Knutsson A, Westerholm P, Theorell T, Alfredsson L, Kecklund G. Mental fatigue, work and sleep. Journal of psychosomatic research. https://www.ncbi.nlm.nih.gov/pubmed/15581645. Published November 2004. Accessed February 26, 2018. Herring MP, O’Connor PJ. The effect of acute resistance exercise on feelings of energy and fatigue. Journal of sports sciences. https://www.ncbi.nlm.nih.gov/pubmed/19424902. Published May 2009. Accessed February 26, 2018.